Online commerce has changed how people shop, and it’s now easier than ever to find something on the Internet, put in your debit or credit card number, and have it shipped right to your door. While the convenience of this method can’t be overstated, there’s something to be said about the familiarity and friendliness of a local boutique. 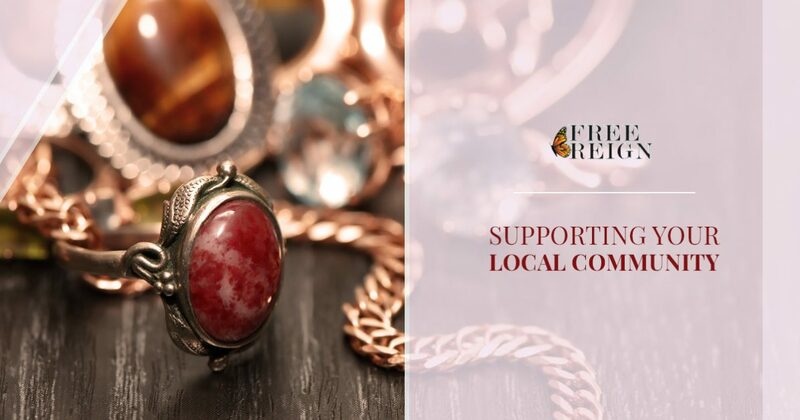 At Free Reign in Conshohocken, we love meeting new people and helping them find the perfect gift, whether it’s for themselves or someone else. Buying home goods locally is a great way to support your community! Another benefit to shopping locally is that you get the opportunity to support artisans who are making things right in your neighborhood. Instead of buying something from a company that’s half a world away, you can purchase a handmade gift that was created in the same city. We love showcasing local artisans and the things they’ve made, believing that it provides that personal touch that many people are looking for these days. One thing that we’re proud of at Free Reign is our ability to partner with local nonprofits and charities by giving them a space in which to hold their events and fundraisers. Charities can also receive a percentage of the total sales made during their events. If you want to bring a group of people together to tackle a certain issue in your community, our boutique is a great place to do so! Face-to-face interaction can be hard to come by these days, as we are all interconnected through our social media platforms and mobile devices. While Free Reign loves the ability to engage with people from all corners of the world, we also love building relationships with customers who visit our store again and again. We recognize them when they walk in, we learn their names and a bit about who they are, and we’re able to help them find the perfect gifts. They might only be after one or two things, such as infused olive oil for the kitchen or handmade lotions for a shower gift, but we’re able to give them the one-on-one service they deserve. Everyone shops in different ways, but if you’re looking for a boutique that supports the local community, has a great selection from resident artisans, and wants to build a relationship with every customer, visit our store today. Our 3,000 square-foot showroom has a wonderful selection of gourmet items including plates, servingware, and more. We also carry jewelry, baby items, and women’s apparel. No matter what you’re after, you can find it here! We’re located inside Kay Lighting and Design, and the experience that began in that store has translated to our boutique. The diversity of products in our store and our commitment to customer service is what sets us apart. We’re always adding new items, so be sure to stop back again to see what great options are filling our shelves.